You Make Artwork Out of What? That’s Right ... Legos. You usually don’t hear of artists being inspired by digital compression techniques. But for Andy Bauch, an L.A. programmer, that’s exactly what led to his fascination with Legos, the colorful plastic children’s toy. Andy uses thousands of Lego bricks to make massive and intricate mosaics that often reference famous paintings, icons or cultural references. Another way Andy veers from the crowd? He not only uses multiple spreadsheets as part of his artistic process, he also writes bits of software to help him complete his patterning. See Andy’s Lego interpretation of Mondrian and Lichtenstein, as well as pop culture portraits on his public profile page. We got a chance to talk with Andy about his Lego obsession, embedding money in his work, and the crossover between being a developer and a practicing artist. Artwork Archive: So, how did this all get started? What was the first piece you created out of Lego bricks? Andy Bauch: I was working at Disney and I was doing a lot of creative things, but they were all virtual. When you build software, there is a lot of creativity, but you’re not using your hands. I had a desire to create something in the real world. 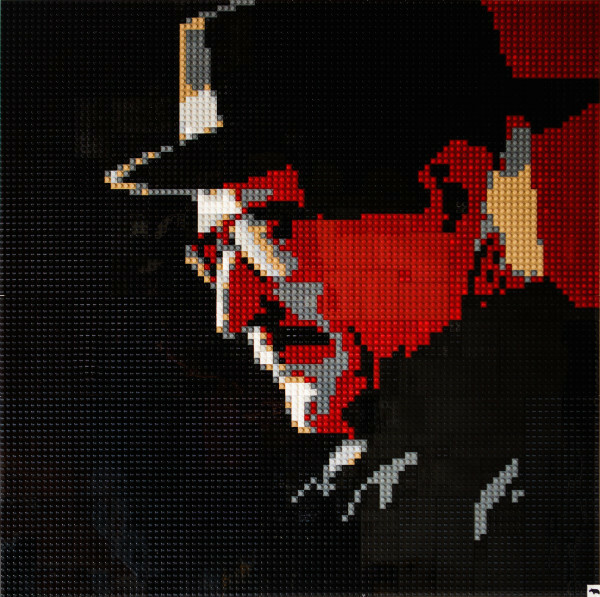 I had tried photography and a few other avenues when I ended up making my first lego mosaic. 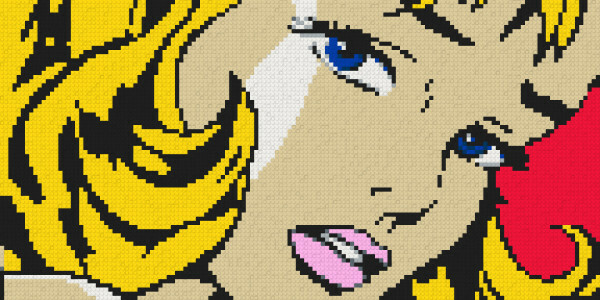 My first mosaic took more than a month to complete and was “Girl with Hair Ribbon” by Lichtenstein. AA: That gets us to the next point: how do you even go about making these massive mosaics? AB: My process changes every year. You definitely need to be a meticulous person to work this way. In the beginning, every step was manual. Now I have written little pieces of software to help automate things. This has enabled me to work on things that are more complex. Some of the pieces are more than 20,000 legos and now I can work a lot faster than I did before. Now I can kind of crowdsource art production. AA: Are there any logistical constraints of using legos as your primary material? AB: Just finding enough Legos is a logistical concern. From the very initial planning, I need to figure out how many to get and where to get them. 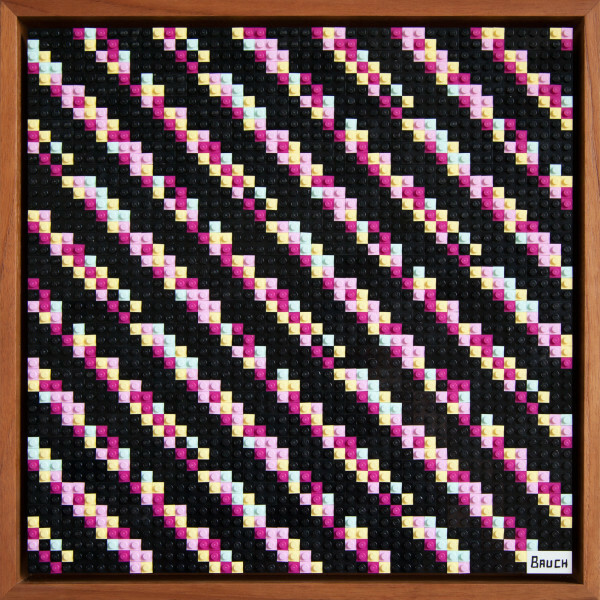 I’m currently working on a commission with 20,000 pieces from 11 people in four different countries. Just getting all the bricks can take some time … then there is putting it all together and actually framing it. 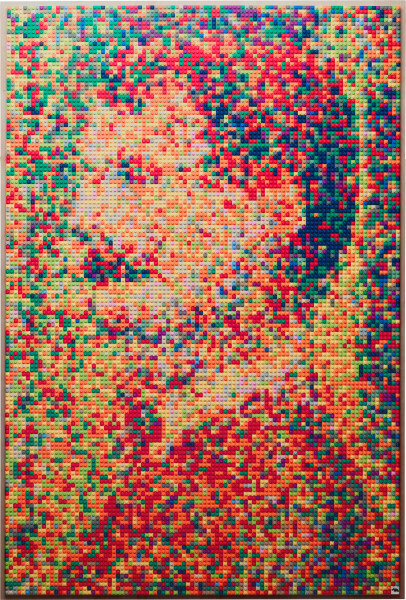 17,100 LEGO pieces make up this Chuck Close portrait by Andy Bauch. AA: I saw that you crowdsourced the creation of the Chuck Close portrait. What was the idea behind this … just to take the load off? AB: The initial spark came when Artshare contacted me to do something for their downtown event in LA. 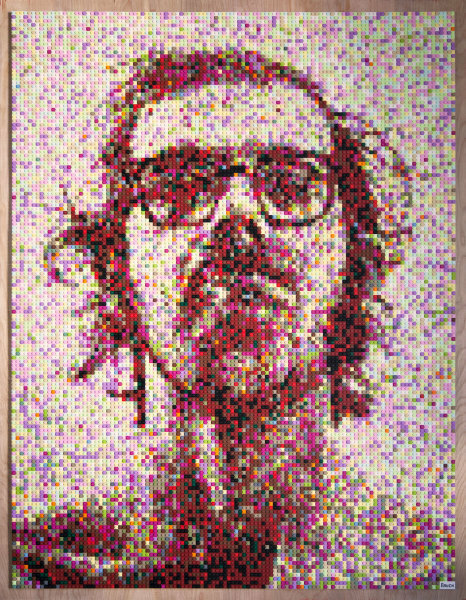 I love Chuck Close and have always wanted to do something related to his work. I thought this would be a good way to put my own spin on it. 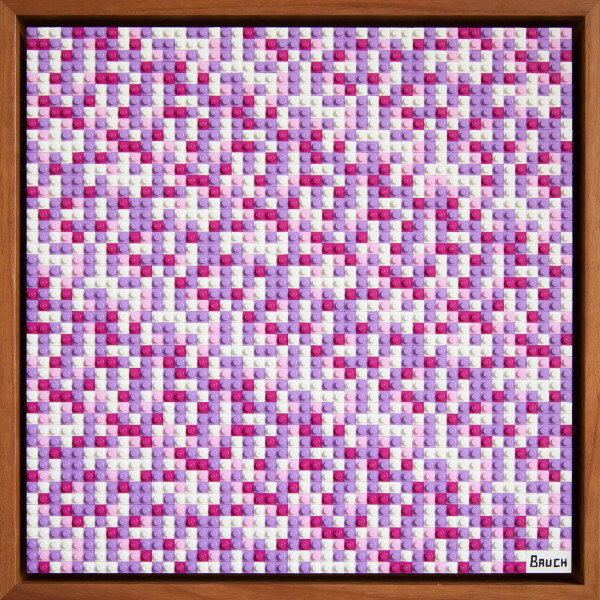 Instead of breaking each image out into a 3”x3” squares like he does, I break my canvas into 6”x6” lego sections and then give people their own map of the section. It’s a way to both focus on the process and invent something new. AA: Any struggles when working on a project at this scale, with this many people and pieces? AB: When I was trying to calculate how big of a piece I could make at an event, I had to calculate how drunk people were going to get. I’m happy to say they were much more efficient than I had anticipated [laughs]. Grown ups seem to enjoy participating in putting together the Legos even more than kids. "Bitcoin Initially Valued at $50" and "Bitcoin Intially Valued at $40" encodes money into the artwork. AA: What are you working on now? AB: I am starting to encode messages and money into the art. They are literally bitcoin wallets that I am exposing to the public. I’ll buy 30 dollars worth of bitcoin and use what is called a secret key to generate a pattern and colors and recreate it. Effectively, anyone can steal that money. I’m not sure if 50 bucks is enough for someone to do it, but someone could look at the pattern on it and decode it, and then be 50 dollars richer. AA: Have you had any lego disasters besides stepping on them without shoes? I’ve never dropped a finished piece, so I don't know that particular pain. I have dropped a piece from the top of an open staircase, though. I guess that's the worst. I glue each lego down, which some lego purists scoff at, so even if I were to drop it, it would be pretty resilient. So, how does Andy keep all the pieces of his art business together? AA: Is there any overlap in being a developer and a LEGO artist? AB: Definitely my computer science background helps in some ways, and hinders in others. I don’t have any trouble with the organizational side of things or thinking of my art as a business. Maybe I did a little at first … but I got past that probably easier than on average. I just also, very simply, wouldn’t be able to make the things I do without making software. I use a lot of software to make the pieces. I have had spreadsheets involved since the beginning,, and now I build databases and things like that in order to construct each piece. AA: How do you balance being a full time developer and having this side gig as a practicing artist? AB: It can be a struggle. I need to be aware of what my schedule is going to be for the next month before I take anything on. I also get help when I’m in a pinch. I can usually convince enough people to come play with LEGOs if I’m really struggling. I’ve had a lot of generous people come and have fun making pieces together. I think it's important to make the time to make art on a regular basis. It’s also important to always have some sort of goal—whether that’s a show, or a marketing goal or completing a piece. I go in phases: new series, new originals, doing PR outreach. I’ll usually go in phases of productivity and sales. AA: We saw something about how you made the Breaking Bad portrait to time with the show … do you have any other business tips or tricks for promoting your work? You have to write a story that a journalist would want to cover, basically. If you can think of something that times with an event, or ties in with a general trend in the world … these are the kinds of things that journalists want to write about. If you can relate your work to that, all you have to do is tell your journalist as simply as possible ... with bullet points most likely the easier you can make it for them, the more likely your story is to get picked up. Andy says that he, “really likes being able to print out product sheets and wholesale catalogs” from Artwork Archive. He’s also pretty geeked about the new exhibitions feature. Use these 5 tips for making a standout digital portfolio and getting more eyes on your artwork.